Businesses of every size can benefit immensely from professional services automation (PSA) resource management software and planning solutions. From automating back office tasks, to increasing team communication and optimizing project workflow, FinancialForce PSA offers a robust professional services projects solution that caters to every business's need. FinancialForce is cloud-based and its robust capabilities are designed to track resource details such as employee skills and certifications to better take advantage of the strengths of your team. Built on the Salesforce Platform, the software equips customer-centric businesses with a unified interface to view all of their project resources from one location. 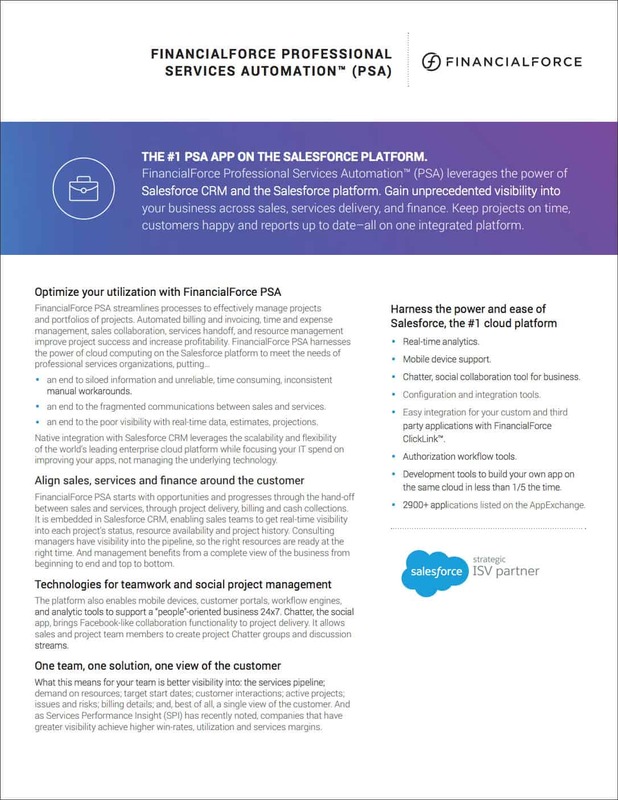 With FinancialForce Cloud PSA software, businesses have access to a services and resource management solution that uses the great power of Salesforce CRM to manage the business's teams, customers, projects and financials in one complete services management application. You can finally stop relying on old spreadsheets for productive resource management, and get seamless collaboration between your sales and services teams. With no more department silos, or disconnected applications, it is easy to monitor and manage project resources, as well as create satisfying customer experiences. With real-time reporting and analytics, and a single login for all business apps, FinancialForce helps your teams plan with confidence. Our PSA software is easy to buy and deploy. To learn how to increase the pace of your services business with our PSA and resource management applications, download the datasheet or watch the video to learn more.